While an investigation into the attack is underway, different media have published varying accounts of what happened at the metro station. According to the country’s state news agency “Belta”, there has been no fire or wreckage at the station. The Komsomolskaya Pravda in Belarus newspaper reported the escalator at the metro station has been damaged by the explosion. 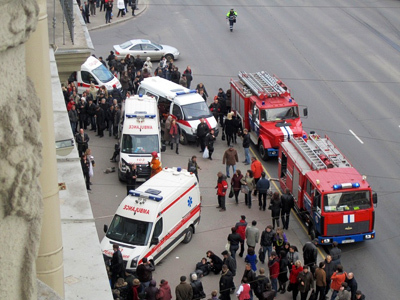 Conflicting reports suggest the blast took place either right on the station platform or in the transfer tunnel near the stairs in between Oktyabrskaya and Kupalovskaya metro stations. Some reports say the explosion went off when trains on both sides of the platform were in the station. The blast produced a huge crater, witnesses claim.People were wounded by the blast and also the debris of the crumbled structures. “The metro station is cordoned off. Ambulances are heading towards city hospitals. The traffic has stopped in that part of the city,” said Vitaly Garbuzov, an eyewitness. “The explosion took place at a busy metro intersection in the underpass. Witnesses say they saw thick smoke rising and black debris scattered. People were carried out of the station into ambulances. That's all I know at this moment,” he added. The metro was closed shortly after the blast. All people have been evacuated from the station. 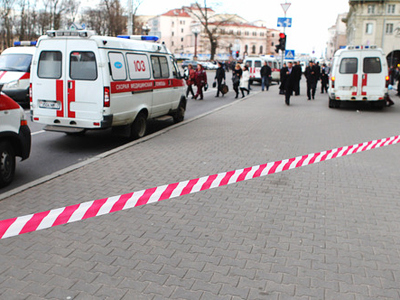 The number one metro line has been closed entirely, while trains on the number two line are paralyzed traveling towards Oktyabrskaya station, where the blast supposedly happened. Oktyabrskaya is the only station with a transfer between the two lines in the Minsk metro, situated right in the center of the city. Witnesses say the mobile network is not working in some parts of the city. Alarm sounds can be heard all around Minsk. Emergency services are evacuating people from underground. So far there been no panic, and traffic on the surrounding streets has not been blocked. 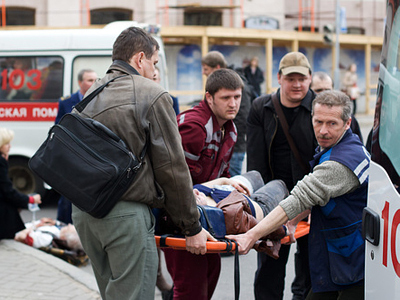 “I saw a number of bodies covered with cloth at the entrance to the station,” an eyewitness told Interfax. Another witness said he saw approximately 30 injured people evacuated from the station. Near the Europe Hotel a first aid station has been set up, as many people have suffered large burns. The traffic on nearby streets has been restored, reports say.